The call came at around 3 PM when I was at work. "Saab kya banao? (what will I make)". Anxious and eager. Slightly conspiratorial. Our maid, Banu, on the days she decides to come to work (today isn't one of them) calls me for instructions on what to cook. She has a poor memory and I have to instruct her each day. She calls Kainaz if I am busy. But doesn't believe her and calls me back for affirmation. I tried an experiment yesterday. Got Banu to make something continental. Not her forte. Previous attempts to get her do something Continental or Oriental have been disastrous. I asked her to finely chop 250 g of button mushrooms, one capsicum (green bell pepper) and fry them in olive oil with salt, pepper, 1 split bird's eye chilly and a dash of ketchup. I told her to fry it till it was dry and add 6,7 leaves of fresh basil (plastic main jo hara patta hain) at the end and keep it. I went home and tasted it. Seemed good. I was going to take this for lunch the next day. 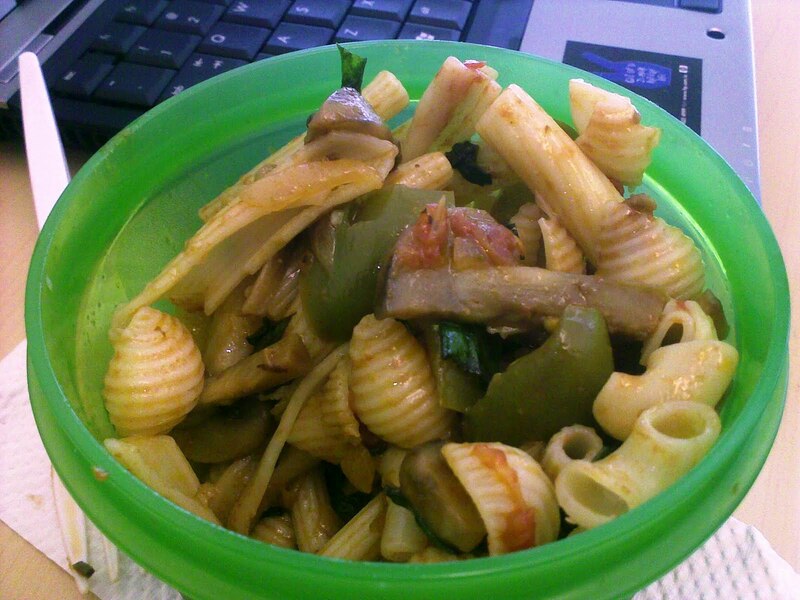 I try to take vegetarian lunches to balance out all the meat that I eat. I don't know what to buy at a vegetable shop. I am usually lost and perplexed. Usually end up buying okra, beans and cabbage. Banu cooks these for my lunch. Ends up tasing like something out of a morgue. Mushrooms were my attempt to liven up things. I was thinking of eating this sautéed mushroom dish with bread when inspiration struck me. I opened a pack of pasta which we had at home. K boiled some for me. She added a bit of salt to the water while boiling as she felt that the pasta with just the mushrooms would be bland. She then put the two together in a lunch box. Inspiration struck her too. She added a bit of olive oil and tossed the mix as she felt that the pasta would otherwise get sticky the next day. I had to reach work early today and was in a meeting on one topic from 8.40 AM to 1.40 AM. I finally got up and told my boss that I needed to have lunch. I went to my desk. Hungry. Tired. I must admit that I was not too thrilled at the prospect of pasta. I was frazzled and felt like some sinful fried comfort food. 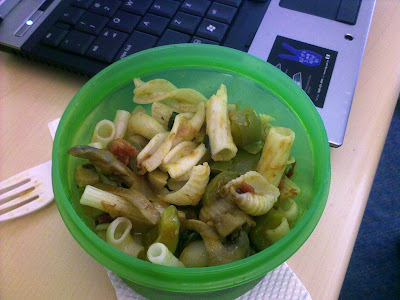 I listlessly took the pasta box up to the micro, heated it for one minute and returned to my desk. Took my first bite. A bit unenthused ... And did a double take. This dish tasted pretty good. The mushrooms gave it a nice springy bite. The basil gave a much needed shot of life. And Kainaz's of tossing the pasta in olive oil wonderfully complemented the mushroom mix. Do you like roasted vegetables? If you do, then you could load a pan of chopped veggies (1" pieces of bell peppers, pumpkin,zucchini,tomatoes, onions, mushrooms, babycorn)into the oven the previous night and roast with one tbsp olive oil, herbs,salt and chilli flakes for 25 minutes. Remove and mix into some boiled pasta. Season according to taste (tabasco sauce/grated parmesan/crushed pepper/balsamic vinegar)and pack for lunch the next day! Gosh, looks yummy!! So simple too. Question: What pasta do you buy? My Ma wanted me to make pasta for her when I went back home to visit, but I didn't like the quality of the stuff I picked up. :-( Of course, I didn't really know what to pick up anyway.. And I don't even know if you would get half the stuff you do in Mumbai, in Kolkata. Rhea whie we do get firang pastas, we use cheaper local one. Our preferred one is a brand called Bambino. Ask her to go for the 'pasta' and not the macaroni. Red and yellow, east bengal jersey, pack. Second choice, which is what we used here is "Bambino". K, try this - Boil pasta/ spaghetti and drain. On a pulse mode of your blender, chop pistachios and basil leaves. Add that to the spaghetti, with EVOO, salt and pepper. Take it for lunch. Come on, eat your veggies. Banu and Kainaz are spoiling you.